I recently did an interview and was asked about the Federal Reserve. There is so much absolute nonsense sophistry that circulates where people think that ending the central bank will somehow cure everything. I really just laid it out plain and simple. The Fed’s balance sheet is a tiny fraction of the economy or the real money supply. 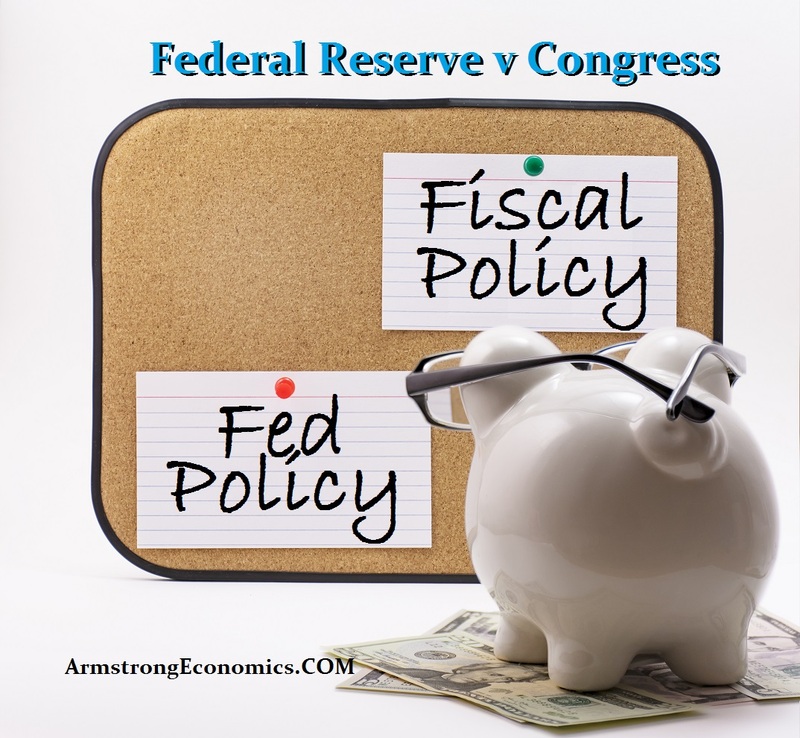 Everyone blames the Fed for everything and they NEVER bother to look at (1) the fiscal policy of Congress, and (2) the banking system as a whole. Even if you want to scream from the top of every hill that $4 trillion worth of Fed’s Quantitative Easing was pure evil and should have created hyperinflation (which it did not), the deficits created by Obama topped $1 trillion per year and those never die whereas the Fed’s QE evaporates as they do let the debt they bought mature and expire without rebuying it again, whereas Draghi and the ECB have conceded they will reinvest their holdings. Look at 2009-2012. Obama created $5.4 trillion that will never expire but will be rolled until there are no more buyers. So let’s do the math. The entire Federal Reserve QE program was equal to 1/5th of the national debt. The ECB bought 40% of all public debt and the Bank of Japan bought 75% of new debt coming to the market. Yet all we get is dollar bashing and people actually have called the yen the safe-haven play. I really do not know if I am arguing with drunks, people with dementia, or just con-artists. All these people pushing the end of central banks because they are clueless about how the real world functions. I have been trying to explain to the world that monetary policy using interest rates to impact the balance of payments is really voodoo economics. The Australian even wrote an article back in 1989 about the advice I was giving to governments. No matter how long I have been at this, trying to overcome manipulating interest rates as a tool to try to control the economy is just totally insane. It reminds me of the skit in Blazing Saddles where the Black guy puts a gun to his own head and says if anybody moves, the black guy gets it. How can a central bank raise interest rates to fight inflation when the government is the biggest borrower in the system? The government deficits will rise because their interest expenditure if the central bank raises interest rates to try to stop inflation. This will increase deficits perpetually because governments continuously roll their national debts and never pay anything off. The central banks have lost all control and the press is just too stupid to even understand the problem. We are hopelessly lost and the idiots who bash the Fed are doing so much harm to society it is not even funny. The bulk of the real world money supply is created by lending on a leveraged basis. It is not money created by the Fed and it goes well beyond that even created by the Congress. At the end of 2017 in the USA, total household debt exceeded $13 trillion. Total non-financial business debt stood at $6.1 trillion at the end of 2017. The Fed’s balance sheet was $4.4 trillion of which $2.4 is US Treasuries. The national debt stood at $20.5 trillion at the end of 2017. If we look at this perspective, this means the money supply is $41.6 trillion just using the debt. If we then add M2 (all accounts & money market accounts) which stood at $13.8 trillion at the end of 2017, this brings us to a liquid money supply of $55.4 trillion. The Fed’s balance sheet does not even reach 10% of that figure. Now let us add the stock market, which is liquid. That reached $30 trillion by the end of 2017. Therefore, the liquid assets/cash position stood at $85.4 trillion at the end of 2017. Now let us add total personal real estate (homes) in the United States which stood at $31.8 trillion. If we include illiquid real estate, now we are up to $117.2 trillion. So how will shutting down the Fed and theoretically eliminate $4.4 trillion solve all the problems?